We address the problem of the interaction (see below) between humans and groups of robots whose local synergy is exploited to accomplish complex tasks. Multi-robot systems possess several advantages w.r.t. single robots, e.g., higher performance in simultaneous spatial domain coverage, better affordability as compared to a single/bulky system, robustness against single point failures. Shared Control: Balancing Autonomy and Human Assistance with a Group of Quadrotor UAVs. 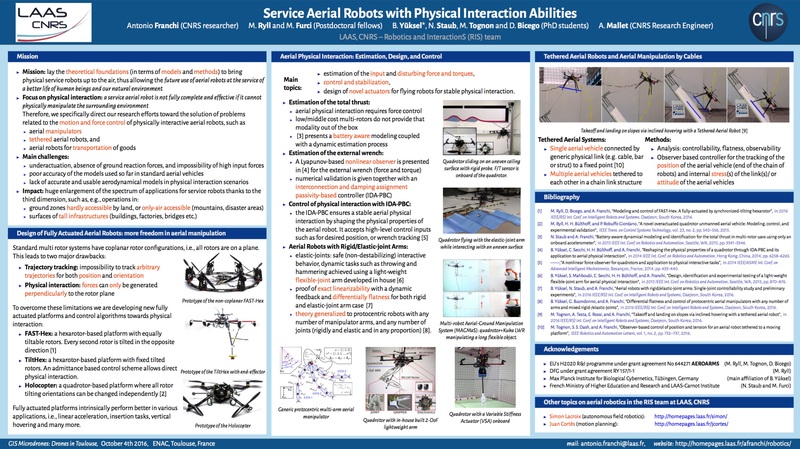 Read more about Shared Control: Balancing Autonomy and Human Assistance with a Group of Quadrotor UAVs.